On June 23, we’ll discuss our next book, The Lady and the Unicorn by Tracy Chevalier. You can read the first chapter for free on the author’s website. This historical novel is inspired by six famous medieval tapestries. Now over 500 years old, these works of art hang in the Musée National du Moyen Age in Paris. 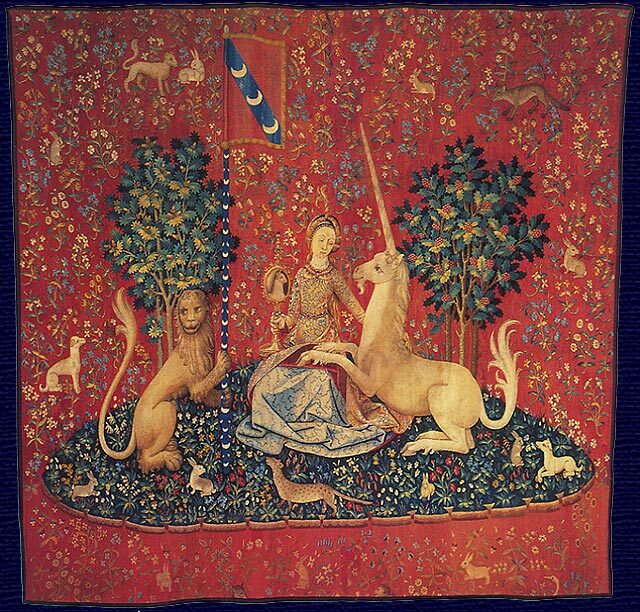 The Lady and The Unicorn imagines the people behind the tapestries: the noble family who commissioned them and the weavers and artists who created them. Chevalier’s story is well-researched, fast-paced, and much sexier than a novel about weaving should be. If you like HBO’s historical dramas, you’ll like this novel. Find a copy of The Lady and the Unicorn at bookstores or at your local library. It’s also available for Kindle, Nook, Kobo, as a Overdrive library ebook (in some regions), and an audible.com audiobook. You can read the first chapter for free on the author’s website. Read the book. If you want to chat about it while you’re reading, use the hashtag #colettebookclub on Twitter or Instagram. Come back to the Colette blog on June 23 to talk about the book. Our discussion of The Asylum by Simon Doonan was quieter than usual. It looks like many people couldn’t find a copy of the book. What a shame! Finally, Sharon shared her personal experience with us. “I worked at Barney’s New York at the 17 street store in the early to mid 90s. It was a bit of a scene and I loved working there. The personalities and temperaments were as dramatic as the clothing. I had regular dealings with Simon and he was lovely.” I was so glad to hear that Simon is as delightful as I imagine! June 23rd The End of Fashion: How Marketing Changed the Clothing Business Forever by Terri Agins. How did fashion change from an elitist business tightly controlled by French designers to the mainstream market it is today? Agins explains in a book that won’t bore you, even if you’re the kind of person who would fall asleep in a business course. When journalist and amateur tailor JJ Lee decides to re-makes his late father’s suit, he starts a journey into his family’s past, the history of suits, and the meaning of masculinity. I have yet to participate in the discussion, but I have loved every book that was recommended. Great choice of books. The variety, historical fiction to current commentary, makes this an interesting book club.